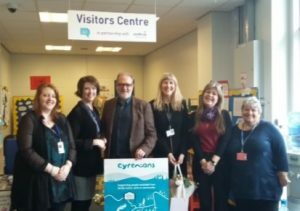 The Cyrenians are now the proud operators of the Visitor Centre at HMP Addiewell after a successful bid to take on the service. The service was operated by Families Outside until April this year. However, as Families Outside has now taken on the national coordination role for visitor centres across Scotland, we are no longer in a position to continue as a service provider. Many of the staff you see above moved over to Cyrenians with the transfer of service: we will miss them and wish them all the very best! The new Visitor Centre at HMP Glenochil, run by Stirling Interfaith Community Justice Group, has now opened its doors to families visiting the prison. The centre is fully accessible to families before they go through security and offers visitors to the prison a comfortable place to wait, receive advice and information, and have a cup of tea or coffee with healthy snacks. There are also activities for children and young people. And visitors to HMP Shotts are now benefitting from a warm welcome, family support, and a range of activities for children and young people offered by Getting Better Together Shotts, who launched their Visitors’ Centre service at the prison earlier this month. The team can be contacted by telephone on 01501 824141 and are available Monday to Friday 9am – 4pm and at weekends until 12.00pm. In addition, they are open alternate weeks on Monday/Wednesday evenings and Tuesday/Thursday evenings.